The E-Type Jaguar has been described on countless occasions as one of the most beautiful cars in the world. Over the years it has built a reputation amongst Jaguar enthusiasts and classic car collectors for being the ultimate classic to own. If you are lucky enough to own one and are planning to undertake the restoration work by yourself, this manual will take you through the full nut-and-bolt r… estoration of a very early example, E-Type Jaguar Chassis No 60. Restoration experts from the world's premier Jaguar restoration company, Classic Motor Cars Ltd, have written each chapter, giving you a first-hand account of the process. Contents: Preparing a workspace and dismantling the vehicle; Restoring and painting the body; Engine, electrics and transmission restoration; Assembly of the sub-assemblies, and final assembly; Trimming; Road testing and the first outing. 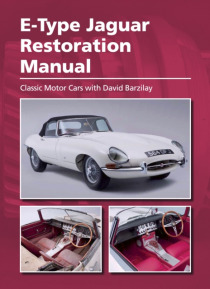 This comprehensive manual for the complete restoration of an E-Type will be of great interest to motoring enthusiasts and motor mechanics, and is superbly illustrated with 700 colour photographs.